This upholstered dining room chair is part of a customization collection that includes a vast assortment of styles, fabrics and finish options. Choose this look for a more transitional or cottage feel. With a shaped back and turned legs, this piece is decorative without being too over-the-top! The Custom Dining Chairs Small Upholstered Side Chair by Bassett at VanDrie Home Furnishings in the Cadillac, Traverse City, Big Rapids, Houghton Lake and Northern Michigan area. Product availability may vary. Contact us for the most current availability on this product. Finish & Paint Options Available in approximately 51 different finish options. Customizable Options Available in over 600 fabric options and 60 leathers. Small, Medium and Large sizes available to fit your home and family. Leg and back styles may also be customized with various style options. 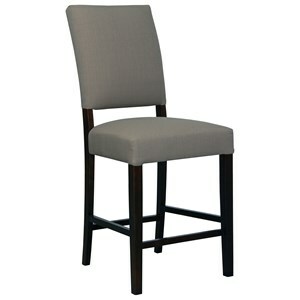 Browse other items in the Custom Dining Chairs collection from VanDrie Home Furnishings in the Cadillac, Traverse City, Big Rapids, Houghton Lake and Northern Michigan area.